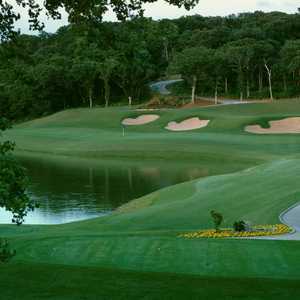 GRAPEVINE, Texas - If you ever wanted to play golf with Roger Staubach or Bob Lilly or Emmitt Smith or any of the great Dallas Cowboy football players, the new Cowboys Golf Club in Grapevine is your best bet. Definitely a must-play for the DFW-bound golfer, Cowboys Golf Club is first-class all the way, and fortunately void of the cheese that you might suspect from an NFL-themed course. In this location next to the Grapevine Municipal and the Lake Grapevine dam, Jeff Brauer created what might be his most impressive design. Why, the former gridiron stars are so accommodating at the course, they'll even carry your bag. Of course, this Staubach won't be the Roger the Dodger, but one of the club's fleet of golf carts featuring the name of a former or current Cowboy player on the side. The carts are one of the more noticeable ways the golf course, co-owned by the Jerry Jones family and Irving-based Evergreen Alliance Golf Ltd., attempts to connect football and golf. And it is an unprecedented attempt. The Cowboys Club is believed to be the first-ever golf course tied to a professional sports franchise. Does it work? Is it possible to link the mystique of the Dallas Cowboys with the game of golf? Not really. The two elements seem to just co-exist side by side. The clubhouse has some Cowboy paraphernalia such as gleaming replicas of the five Super Bowl trophies and autographed photos, but they seem somewhat superficial in relation to the golf. There are no helmet-shaped bunkers, or goal posts on the practice range or, sadly, no beverage cart girls dressed as Cowboy cheerleaders. All these ideas were considered, but ultimately dismissed for fear of being too hokey. The good news is the course doesn't need any of it. Built on 159-acres of secluded land near Lake Grapevine, the meandering layout features so many hills and trees golfers may forget they are in North Texas. In particular, the tee box on the fourth hole sits some 120 feet above the fairway, undoubtedly the largest one-shot elevation change of any hole in the Metroplex. Toss in some unparalleled touches in service, such as making iced mango-scented towels available to sweaty golfers during their round, and the Cowboys Club ranks as one of the area's most unique golf experiences. As it should, considering the green fee of $125 makes it the most expensive golf experience in the area. At least the fee includes all the food and non-alcoholic drinks you can consume before, during and after your 18 holes. Next time you get to use your expense account to entertain an important client with a round of golf, Cowboys Golf Club should be your choice - unless, of course, the client is a Redskins fan.